Meet 45-year old Zena Martin.She spends her days working full-time as a marketing communications consultant for large corporations and public entities. At night, she bakes. As "Chief Cookie Creator" of Cookieluscious, the made-to-order cookie company she founded last year, her goal is to one day become a full-time entrepreneur. "You have to love what you do or it's not worth doing because you make so many sacrifices along the way," says Martin.While she has spent her entire career in marketing (more than 20 years!) and takes pride in her board work (She currently sits on four boards of directors), there's nothing she enjoys doing more than baking. "I really like spreading happiness, and putting a smile on people's faces," says Martin, who started the company after doing some thoughtful soul searching, and per the encouragement of her biggest fans: her family and friends. From getting permission with the local government to operate out of her home in London to buying the urls, getting trademarked, building her website, Martin is doing everything on her own. And because she's the type who wants "everything done now!" and is a perfectionist by nature, it's been a "lesson in patience," she says. 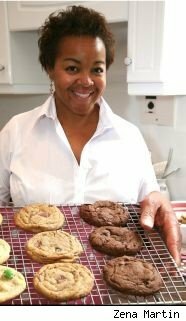 Martin currently devotes about 30 percent of her time focusing on cookies, baking about 300 cookies a week (all natural; preservative-free), and proudly counts Hewlett-Packard and Thomson Reuters among her corporate clients. "I'm anxious to see what I could do if I were to spend 70% or 80% on my time on this, she says. Martin has kept her start-up costs to a minimum (about $1,000, she estimates). Among her initial investments: logo-generating software from logosmartz.com, business cards from vistaprint.com, branded napkins (featuring the company's url), glossy postcard flyers from Kinkos, and special voice mail services from a local provider. Martin, who additionally recommends Intuit for small business needs (it's got everything from financial software to website services), also advertises on Google AdWords, and uses social networking sites to get the word out. "Facebook has been amazing because I have such a visual product," she says. Whether hustling to get a last-minute custom order out for a child's classroom birthday party, or preparing for a photo shoot with just a couple of days' notice (her cookies will be featured in an upcoming issue of Conde Nast's Brides magazine), Martin makes it happen. And then some. "If I can't over deliver, then what's the point?" "It doesn't matter if you're going to the dry cleaners or an actual networking event, you always need to have business cards because you never know who you're going to meet," says Martin. She recently met a potential client at a restaurant opening, and another at a fitness class. "If you don't have your business card -- your name, your branding -- you miss an opportunity."